Voucher for a memorable sunset cruise in the magical waters surrounding Magnetic Island aboard a beautiful 58 foot sailing yacht with delicious wine & local cheeses (included). Optional extra: Dinner at Peppers Blue on Blue Resort. 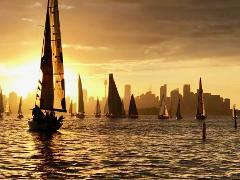 Gift voucher for a memorable sunset cruise on Sydney Harbour aboard a beautiful 58 foot sailing yacht. Includes local organic wines, premium beers and delicious cheeses and a gentle sail past the Sydney's highlights. 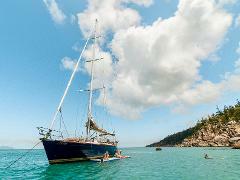 Gift voucher for a Lunchtime Sailing Cruise to a beautiful bay on Magnetic Island. Fun sailing followed by the opportunity to explore the beach, enjoy a swim or relax before a delicious BBQ & local seafood lunch (included in price). 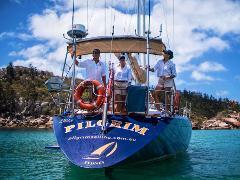 Voucher of $100 to spend on any Pilgrim Sailing product. Gift voucher to come Twilight Racing with Pilgrim Sailing. An amazing way to see the harbour in a different light where guests can pull ropes with the crew or just enjoy the spectacle! !